No these are not my cards. 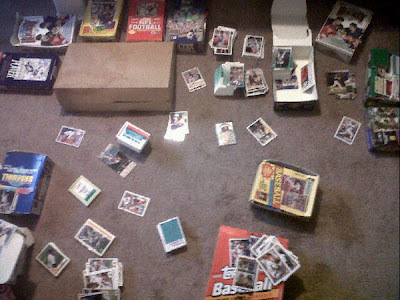 I completed purging my own "collection" of such worthless crap several years ago. Knowing the success I have had with the legit vintage consignments, my wife offered my assistance to a friend of hers to sort and sell her son's childhood "collection", with any money going to her grandson. Begrudgingly I went over to her house and loaded up about 30,000 cards of utter junk. I have since asked my wife if anyone offers to take advantage of my services to please let me talk to them first because this is obviously something I don't want to waste my time on, but unfortunately I am now obligated to. I was half tempted to tell her to take themto a Good Will drop-off, take a receipt and write $100 on it for her taxes next year. You guys all know what I think should be done with it. Most of this will be dumped at one of the several garage sales we have each summer. The good news from a selling standpoint, is that a lot of the original boxes exist, meaning I can put all the cards in the appropriate box, mark $5 on them and be done with it. The bad news is that the boxes aren't filled with their corresponding cards. Go figure.